Bob Mondavi was a force of nature. He was happy leading the charge; no – he was happiest leading the charge. He was the charge for several decades in the Napa Valley, in the bright new world of American wine. It pushed all his buttons and put Napa Valley on the map. Oh yes, he had many officers and gentlemen who contributed greatly to the cause, but Bob was the general. He knew it, and so did all of us. Right man, right place. Simple as that. He envisioned the Napa Valley Wine Auction, and I remember participating in the first steering committee meetings. Bob asked me to write the very first press release announcing the Auction. He led that charge. The Auction proved immediately successful, but no one, not even Bob, predicted that it would eventually contribute 100 million dollars to the health care, education, and charitable support systems within the Napa Valley. It, like Bob, is now a force of nature, with a lot of working parts, a whirlwind of thousands upon thousands of volunteer hours and millions upon millions of Vintner dollars, and even more Vintner sweat equity. It is a party I wish all wine lovers would attend at least once in their lifetimes. One year, serving again on the steering committee, I was a vintner point person overseeing a lot donated by a group of investors whose daytime jobs were to produce and distribute the James Bond movies. They wanted to load up James’ hot new BMW with cases of wine for their donation lot. I presented this idea to the committee, but in those innocent days, they were dead set against lavish lots that included extensive lavish travel, cars, yachts, or anything that was not first and foremost Napa wine-centric. So the car didn’t make the cut, but a fancy Bond gadget-like table filled with wine did. We had a special lot that needed a special introduction, and I was asked to come out during the auction dressed as Bond and announce myself as “Bond, James Bond”. Somehow I did not feel I was right for the part, only one person was: Robert Mondavi. I called Margrit Mondavi and she promised to discuss it with Bob and get right back. Bob was on board within the hour. When he walked up to the microphone, and announced, “I’m Bond, James Bond”, the crowd went nuts, and I truly think Bob had one of his happiest auction moments that night. James Bond had found an Italian suit to wear and it fit very nicely, thank you. A lot of us who worked alongside Bob on committees and boards for long periods of time knew he was a brilliant marketing man, a visionary, and some thought, a self-promoter. Some of his peers often sensed he was first promoting Bob, then his wineries, Napa Valley, and the “Good Life” as he put it. However, if you spent a lot of time working with him, a larger picture emerged, a broader vision of the man. He started solo, breaking from the family business in 1966, small and very focused. He was going to make wines that would challenge any made any other place in the world. Bordeaux, Burgundy, Loire, Champagne, Tuscany; wherever the greatest wines had history and international market share. He wanted Napa Valley to have its own history to tell the world, and definitely a larger piece of the international wine market pie. Mondavi had grown to 10 million cases when Bob was forced to sell the winery in 1997. In 1968 they had crushed a total of 500 tons, about 30,000 cases. Over those last two decades, Mondavi had launched new brands that carried his name – Robert Mondavi Private Selections and Mondavi/Woodbridge – supermarket mega-brands made with grapes grown outside the Napa Valley, and I sensed the discomfort in Bob with some of the directions his family business had taken. With the increased production and increased number of brands, the name Mondavi, Robert Mondavi, grew bigger. 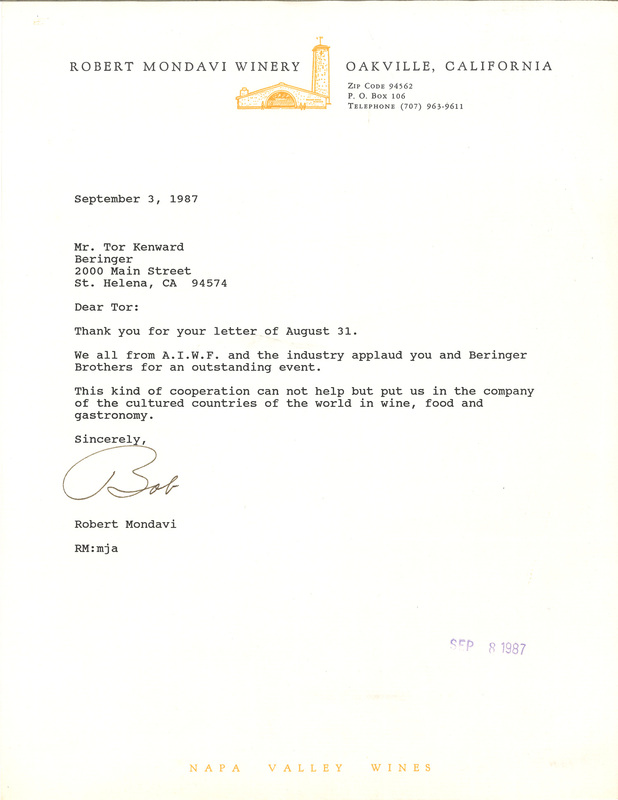 It was a double-edged sword for Bob, but I think he would have given up much of the fame if it had meant not feeling forced to take the company public in 1993. He was losing control of the initial vision, and family members were not at all in agreement on what the future of the winery should be. During this period, however, I watched him privately and publically encourage and support new small wineries getting into the business, and help many dreamers find their way into the Napa Valley mix. He knew they were essential to the message that Napa Valley could produce world class wines. I watched this and grew to realize it was not really all about Bob, but about Napa Valley’s place in the hierarchy of international wines. He partnered with Chateau Mouton and the Rothschild family, then later with the Frescobaldi’s from Italy. Napa Valley was an equal, not a New World upstart. I cannot count the times I heard Bob stand up in large gatherings and repeat himself, time and time again. Some of our peers would mouth the speech before Bob said the first word. They knew it by heart. Yes, he grew repetitive, but he was highly effective over time. Just look at his legend today. It grows larger by the day. Without Bob Mondavi, Napa would be great, but not as great as it is today.